It is a two-headed beast Donald Trump calls voter fraud and rigged elections. Like Hollywood creatures, though, this goblin is completely imaginary. It’s fake like the sasquatch and chupacabra. There’s no scientific evidence of its existence. The GOP antidote for its imaginary monster is horribly real, however. It is voter suppression and intimidation. That is a tangible two-headed beast of appalling proportions. Fearing they could not win fair and square, Republicans took steps to prevent young, old, black and Hispanic people – people likely to vote Democratic – from reaching the polls. This GOP Frankenstein threatens democracy itself. Image by Ryan Merkley on Flickr. Two statistics are important to know when trying to detect which election monsters are real and which are not. Loyola Law School professor Justin Levitt, an expert on civil rights, has trackedallegations of in-person voter fraud for years. In-person fraud is the kind Republicans are talking about, someone pretending to be someone else, or a dead person, to vote. Levitt, who is on leave from the law school to serve as deputy assistant attorney general in the Civil Rights Division of the U.S. Department of Justice, tracked down and validated 31 instances of that happening since 2000. It’s probably 32 cases now, since police in Iowa charged a 55-year-old Des Moines woman Thursday with felony voter fraud. The Republican admitted casting two early votes for Donald Trump. That is 32 cases out of more than 1 billion ballots cast. That’s fraud, but it’s not a real problem. Republicans across the country insisted on “solving” this non-problem by forcing all voters to obtain very specific types of identification. In Texas, for example, the GOP said an open-carry gun permit would be fine, but a student ID card from a state university would not. That would help keep those pesky young people, who tended to vote Democrat, away from the polls. In many states, civil liberties groups like the ACLU sued to overturn the voter ID laws, forcing the GOP to search for voter fraud cases to justify their legislation. In Pennsylvania, the state had to stipulate in court that none existed, and the law was overturned. Not surprisingly, the GOP failed to dig up cases in Wisconsin or Indiana either. Thirty-one in 1 billion is kind of few and far between. The second statistic is this: if Pennsylvania’s voter ID law had taken effect, it could have prevented more than 1 million citizens from voting. That’s the number of registered voters in just one state who did not have the required ID. Again, that’s a state where Republicans could show not one single case of voter fraud. While the ACLU and other civil liberties groups continue to try to overturn unnecessary voter ID laws, the Democratic National Committee asked a federal judge last week to prevent Republicans from intimidating voters, particularly at minority polling places, as Donald Trump has encouraged his supporters to do. Despite Webb’s assertion that he’s not going to do anything illegal, deliberately attempting to make racially profiled voters “a little bit nervous” while they are attempting to exercise their most basic right as citizens violates federal law as well as the terms of the consent decree. In addition, the lawsuit notes that the Pennsylvania GOP has attempted to reverse a state election law requiring poll watchers to be registered voters in the county where they are monitoring balloting. That law makes it impossible for Trump’s rural white supporters to guard the polls in inner city Philadelphia and Pittsburgh to ensure that the undead from George Romero’s “Night of the Living Dead,” filmed near Pittsburgh, don’t vote repeatedly there. There’s no reason to reverse this state law, the lawsuit says, except to license Trump supporters to intimidate and harass minority inner-city voters. Judge Debevoise dismissed GOP arguments that voter fraud is a problem. By contrast, he said that suppression of minority voters is a serious issue. That was seven years ago. But it was a point the DNC repeated in its arguments last week. It acknowledged that Trump keeps harping about a rigged election and dead people voting. And it provided lengthy proof that these are fears without basis in fact. They are boogeymen. The DNC asked the court to extend the consent decree another eight years and to issue an injunction forbidding intimidation at the polls. Election Day is just a week away, however. Even if the court rules for the DNC, it’s not clear that every Trump supporter with a red shirt, a gun and ill-intent will hear about the decision before Nov. 8. So civil liberties groups are preparing for the worst. If a red-shirted goon shows up at your polling place, call the ACLU at 866-OUR-VOTE or the Department of Justice Voting Rights Hotline at 800-253-3931. They have goon-buster teams nationwide. 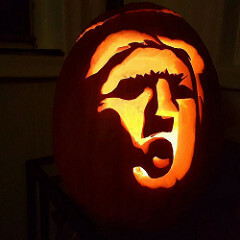 Don’t let anything frighten you from voting on Nov. 8.